March is the transition month that leads us into Springtime, even though we still have snow in the forecast and some still on the ground in many places, it shall pass and warmer weather will come. 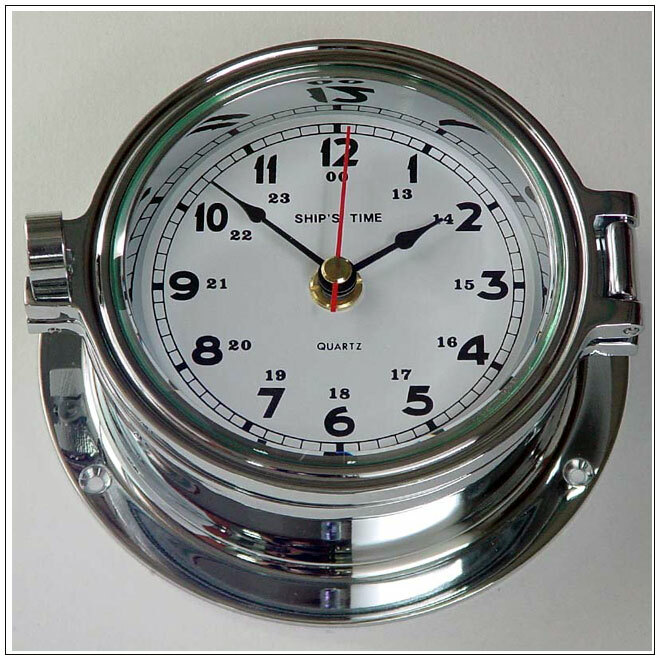 However, March is a month of constant changing weather so we suggest having a set of our weather instruments on a wall or bulkhead for quick reference. it is always best to pay attention to changing conditions for safety. 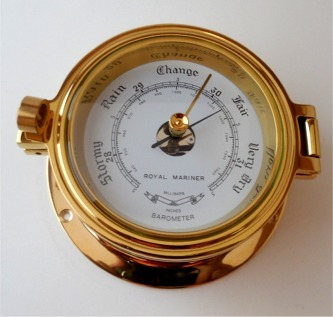 Our professional Barometers will give you an accurate indication of pressure changes while a Thermometer tells you of temperature changes. Together they can warn you of approaching severe weather. We have placed them on SALE on this page to help you "Keep a Weather Eye". Now, as soon as it warms up a bit many people will be entertaining outside on decks, patios and boats. Thus we have our new line of durable dinnerware showcased below. 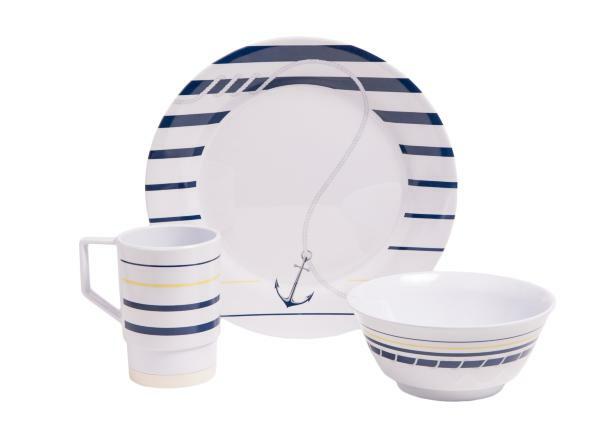 Pick a set and dine outside (or inside) in fine nautical style. ..And as usual, have a safe and enjoyable change of season. 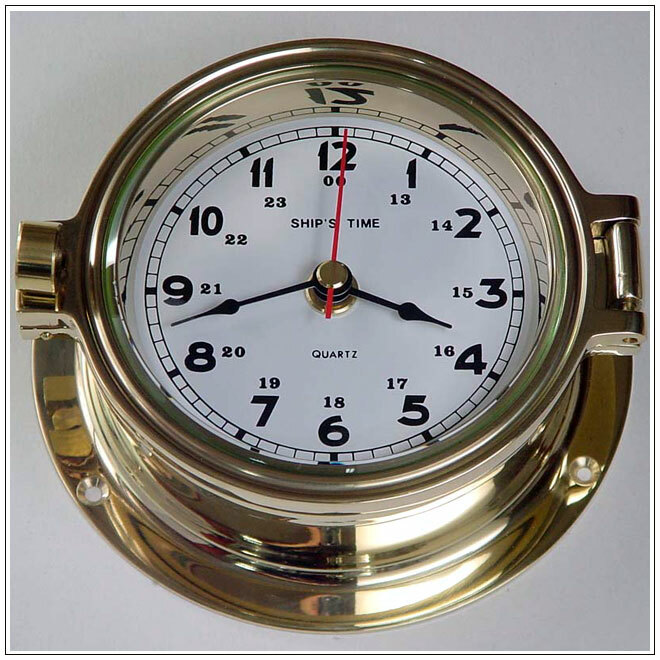 3-Guage on wood base. 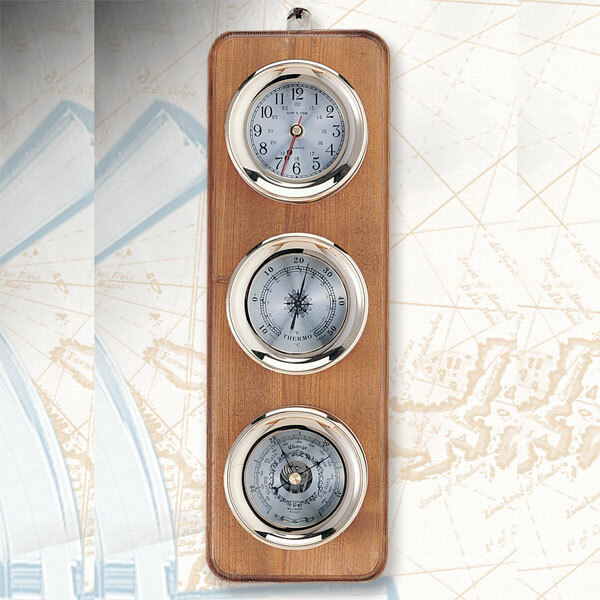 Solid brass clock, Thermometer and Barometer all mounted on a solid Oak base. 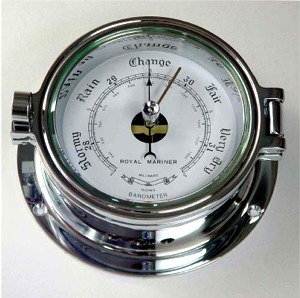 The Barometer measures changes in barometric pressure, thermometer measures temperature. Together these give an accurate reading of future weather events. Instruments are all factory lacquer coated for lasting shine. 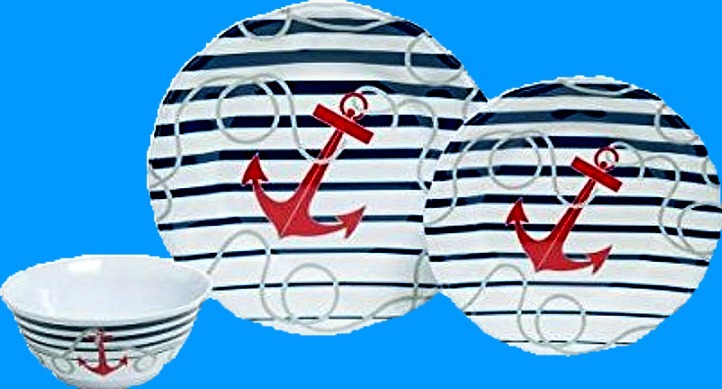 Base is 18" x 6"
Very nautical dinnerware sets in unbreakable Melamine with non-skid bottom rings and look like fine china. 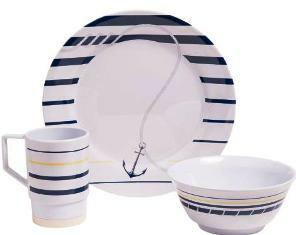 Dockside Ceramic-Look Melamine Dinnerware Set - Service for four - 12 pcs. Larger sets and serving pieces available. Newport Melamine Dinnerware Set - Service for four - 12 pcs. 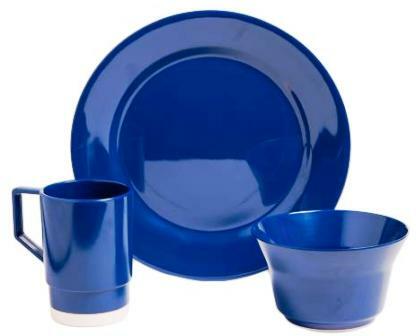 Royal Blue Melamine Dinnerware Set - Service for four - 12 pcs. 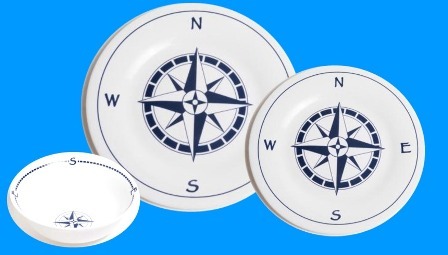 Nothing says high class Nautical like a set of Compass Rose Dinnerware at your dining table. 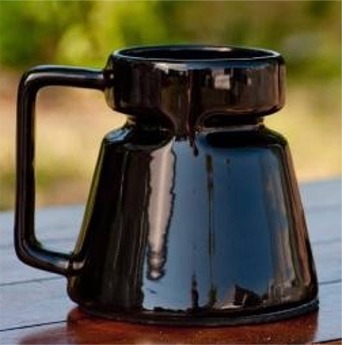 Shatter resistant, dishwasher safe, microwave safe and will NOT scratch with a knife. 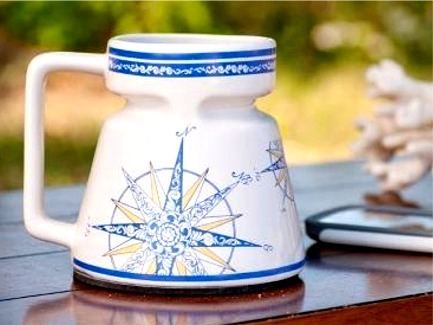 Possibly the most ingenious and needed coffee mugs ever made for those of us who spend lots of time on our boats or the trains or any other form of moving transportation. Our heavily glazed Mugs are all the same size and specs. The cone shape makes it difficult to tip over while the non-skid bottom ring holds it in place. 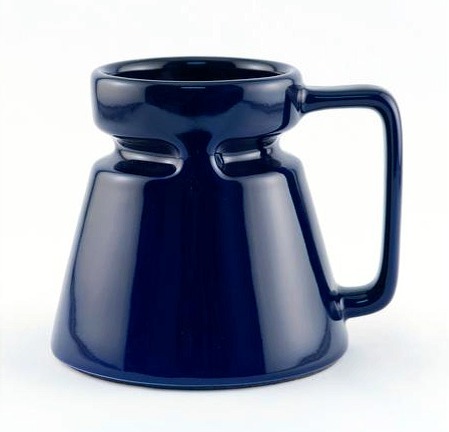 To add to this is a spill resistant insert that keeps liquid inside. Size: 4-3/4" x 4-3/4" -16 oz.